LX Series - Cytec Corp. 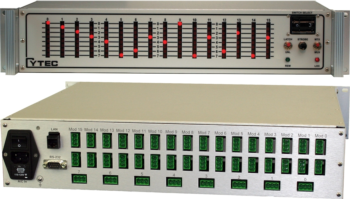 The LX Series matrices are reliable, low cost, and versatile switching systems. A modular design concept is used. Interchangeable control modules, switch modules, and display modules can be assembled into matrices, multiplexers, or individual switch point configurations. All chassis have full front panel LED displays. Status feedback from all switches is provided. 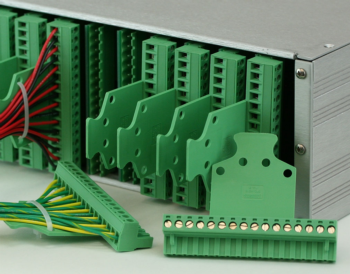 These Chassis control up to 16 modules with up to 8 relays per module. A large variety of different switch modules are available to build almost any configuration. Modules are available to build matrix or mux configurations or discrete relay modules. Input detection modules, output driver modules and proto board modules allow custom systems for almost any application. LEDs on the front panel show switch and power status. A thumbwheel manual control is optional. LX K type modules have discrete relays with individual contacts wired out to the rear panel connector as shown in the figures to the left. LX8/ID modules have discrete circuits that can be used to detect contact sense, DC Volts, Current flow, AC sense, threshold voltage or whatever circuit you can dream up. 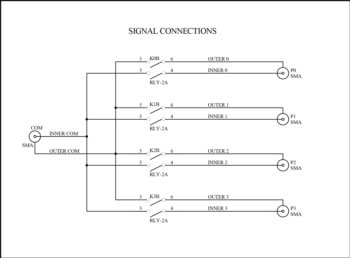 Detection circuit is opto isolated and allows status feedback to your computer. 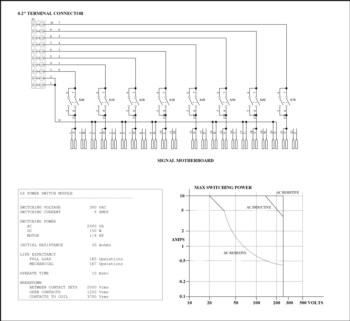 See circuit examples in the drawing to the left. There are 8 circuits per module. Specify what circuit you would want on the prototyping section of the board. 20 Pin header connector for I/O. LX8/OD modules have discrete circuits that can be used to drive external devices such as large relays or solenoids. These driver modules are available with three different transisters or per your specs, to deal with TTL signals all the way up to 8 amps of current at 100 VDC. Opto isolated drives with status feedback to the remote computer. 16 Pin Screw Terminal mating connector included. LX8/G1P-ST Switch Modules are 1x8 Single wire configurations per module. The x8 relays can be bussed across all module slots for power distribution or the motherboard connections can be cut so each module simply acts as a single 1x8. !0 pin screw terminal connectors for easy wiring. Handles up to 8 amps hot switched and up to 2000 VA of switched power. The LX4/4x1-2-SMA Switch Module is a two pole 4x1 mux with SMA connectors switching both the signal and outer conductor of the SMA connectors. 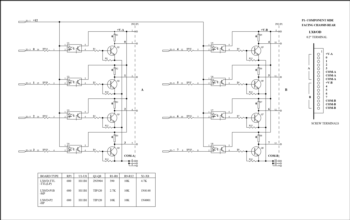 Makes a useful 4x1 RF mux when the ground must be isolated from the switch chassis ground. Bandpass of 150 MHz. Type S reed relays with switch times of 1 ms. Will handle +/- 200 volts and up to 1 amp. These Chassis are preconfigured single or two pole matix systems. A single chassis can be a 16x8 matrix, two 16x4 matrices, a single 32x4 or a single 64x2 configuration. Chassis is modular so you may start with a smaller size and increase the configuration as your needs grow. LEDs on the front panel show switch and power status. A thumbwheel manual control is optional. 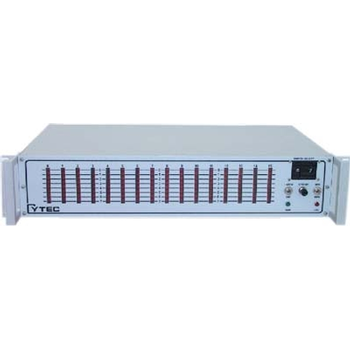 Remote control is from 10/100 LAN, GPIB, RS232, USB or TTL. A variety of relays are available to handle almost any voltage. Connector options are BNC, Screw Terminal or Twinax. 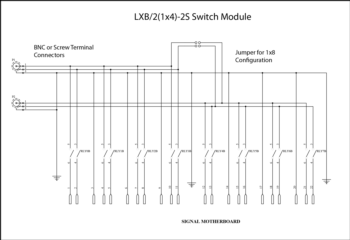 LXB/2(1x4) Switch Modules can be used to build dual 16x4 matrices, a single 32x4 matrix or a single 16x8 matrix. 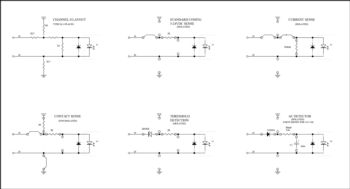 A variety of relays and connector options allow configurations for almost any signal. Matrix configurations are non-blocking and allow any or all relays to be turned on at the same time for signal distribution. 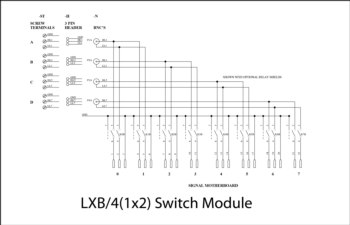 LXB/4(1x2) Switch Modules can be used to build 64x2 matrix configurations. Modular construction allows any size from 4x2 to 64x2 simply by adding more modules. A variety of relays and connector options allow configurations for almost any signal. Matrix configurations are non-blocking and allow any or all relays to be turned on at the same time for signal distribution.